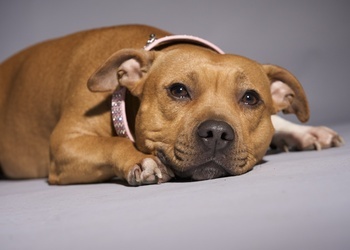 Despite its 19th century reputation as a ferocious and fearless competitor in the cruel sport of dog fighting, the modern, well-bred Staffordshire bull terrier (SBT) is an affectionate, friendly, and loyal companion. At only 24 to 38 pounds, the SBT’s impressive, muscular frame is now a relic from a distant time when dogs slept in the backyard instead of the bedroom and often proved their worth through the use of their agility, strength, tenacity, and teeth. Through nearly a century of careful selective breeding for temperament, the SBT has become as suitable for the family as they once were for the fighting ring. As with other purebred dogs, along the path of breed improvement, the SBT has developed some inherited diseases that have caused problems for SBT owners and breeders alike. One of the most concerning inherited diseases in the SBT is the neurometabolic disorder commonly referred to by the acronym L-2-HGA; short for L-2 hydroxyglutaric aciduria. Dogs affected with L-2-HGA lack functional copies of a protein important in eliminating L-2 hydroxyglutaric acid (a normal product of metabolism) from the body. As a result, L-2 hydroxyglutaric acid accumulates in the urine, blood, and cerebrospinal fluid. Though the exact mechanism is not well understood, affected dogs develop progressive brain damage and related neurological clinical signs including seizures, loss of balance, abnormal gait, behavioral changes, dementia, tremors, muscle cramping, and loss of previously learned behaviors. Most affected dogs begin showing clinical signs around 4 to 12 months of age. However, some dogs will not show signs of disease until several years old. Though some affected dogs display only mild clinical signs and others improve through the use of anti-seizure medications, there is no cure for L-2-HGA and more severely affected dogs may be humanely euthanized due to quality of life concerns. Thus, genetic testing of dams and sires prior to breeding and informed selective breeding practices are crucial in the elimination of suffering caused by this debilitating disease. L-2-HGA is inherited in a recessive fashion meaning that dogs must inherit two copies of the L2HGDH mutation (one from each parent) in order to develop disease. Dogs inheriting a single copy of the mutation are considered carriers of the disease and will not show clinical signs themselves. However, carriers can have affected puppies when bred with another carrier of the same genetic mutation. In order to prevent affected puppies, carriers should be bred to dogs that have not inherited the L2HGDH mutation. As with all inherited diseases, it is not recommended to breed affected dogs.